5’10 x 19 x 2 7/16 29L PU, stock glassing, FCS I x 3 The Ignite model is my latest edition to be added to our range – it has an incredible off-the-mark quick start once you’re up and riding, and is very responsive in and out of turns. So if those weak or slower conditions are on offer, this board will lap up any wave thrown at it. The Ignite design has being refined to work well in most favourable or banging conditions, as I have blended two models into one. With my recent travels on tour with Jordy, I have seen the changing of the guard during 2014. So my main concept was to have a board design that will allow you to reach better options when riding waves of consequence. Therefore we kept a standard nose lift and reduced the bottom rocker in the belly, keeping a strong 1/4” concave running throughout the hull and behind the fin area. We added a decent tail-lift, giving us better opportunities of holding when doing power arcs and tighter turns. Our focus was to have a board with plenty of squirt at all times. We have noticed that the new surf trend is moving to surfboards having a little more all-round surface area. Volume and added surface area, when pressure is applied, equals speed! So this design, with a slightly wider plan shape and a straighter tail section, will generate speed and with a hip in the pulled-in tail area – will give us plenty of hold when needed in more hollow waves or punchier beach breaks. 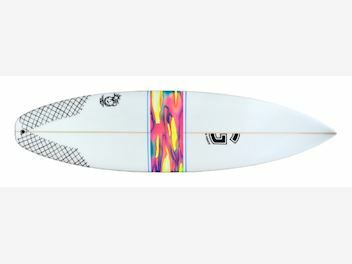 The fun aspect is that this model is a board for all sessions and comes in two fin options; 3-fin thruster or 5-fin setup and ridden only 1 -2 inches shorter than your standard high performance board and recommended to surf in 2ft to 5ft waves, probably the most common wave size ridden globally on a day to day basis. We live, breathe and dream anything & everything surf related. BUY DIRECT & SAVE - TOP QUALITY PRODUCTS DIRECT FROM THE IMPORTER! Check out our website page for more board models and info.